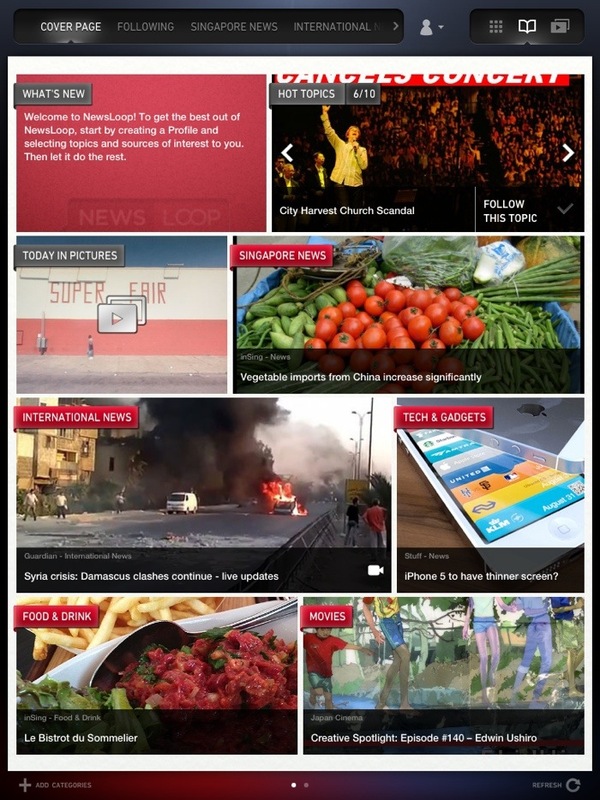 18 July 2012, Singapore – Singtel’s NewsLoop iPad App is the latest news e-Reader app that lets you stay in the loop through an aggregation of international and local online media as well as local bloggers. This app lets you swipe away to get news and stories with different point of views, from “politically correct” to “personal opinion” driven content, somewhat similar to that of Flipboard. There are more than 230 local, international media sources and blogs including Reuters, Bloomberg, BBC, Time, Chicago Tribune, ESPN, TODAY, The Online Citizen, Channel NewsAsia, Mr Brown, publichouse.sg, ieat.ishoot.ipost, Chubby Hubby, CNet Asia, Techgoondu, Tech65 and Lady Iron Chef and many more. NewsLoop is available for free download from the Apple App Store.